In April 1995 a special Labour Party conference dropped Clause IV, part 4 (the 'socialist clause') of its constitution. This decision cemented the ideas of profit and privatisation into the heart of the party. The process of Labour becoming just another capitalist party began in earnest with the attacks on socialist ideas by Neil Kinnock, who was elected Labour leader after the party's heavy general election defeat of 1983 - which the right-wing Labour MPs falsely blamed on the party's 'left-wing' manifesto. The swing to the right was extended by the next Labour leader John Smith and then reached its peak through chief privatiser and war-monger Tony Blair. This process didn't occur in isolation of course. The economic boom of the 1980s and the collapse of Stalinism in the Soviet Union and Eastern Europe dazzled many Labour leaders with the idea that capitalism had 'won' and that socialist ideas, or even the idea that there could be any alternative to capitalism, were old hat. This shift to the right and the abandoning of reformist ideas, let alone socialism, was reinforced by the defeats of the trade union 'heavy battalions' - miners, print workers and others - in the 1980s. 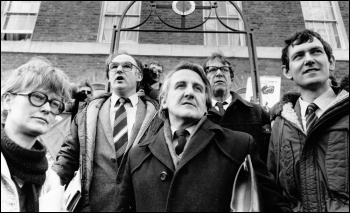 These defeats weren't, however, because of a lack of willingness by workers to fight the bosses and the Tory Thatcher government, but were due to the conscious betrayal of the right-wing Labour and trade union leaders. Consequently, no coherent opposition was mounted against Thatcher's vicious attacks on workers. It was left to trade union fighters, particularly the miners, and socialists, like Militant (forerunner of the Socialist Party) supporters in the leadership of Liverpool City Council, to show there was an alternative. Even the army of non-payers who defeated the poll tax and brought Thatcher down, was attacked and leading Militant supporters expelled from the Labour Party. Opposition Party branches and the Militant-led Labour Party Young Socialists were closed down, and the party's democratic structures weakened. So the dropping of Clause IV was simply the end of a lengthy process to prepare the Labour Party for a capitalist future, cosying up to the fat cats. Tony Blair surfed into office in 1997 on a wave of revulsion against the Tories. He hit the ground running. Nothing Thatcher had privatised was renationalised. Instead, more and more of the public sector was lined up for privatisation. Local councils and other public bodies became less and less accountable to the people who had elected them. The ability of the trade unions to have any role in policy making in the Labour Party was drastically curtailed, in spite of the still significant donations being made to the party from trade union members' subscriptions. In fact, any policy input from rank and file Labour Party members was ruthlessly snuffed out. It was hardly any wonder that Labour lost the 2010 general election to the Con-Dem coalition. All that 'modernisation' hadn't guaranteed electoral victory at all. "They're all the same" sums up what thousands of workers make of the current establishment parties. 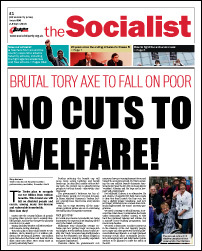 Today, Labour presents no alternative to the Tory attacks but the Trade Unionist and Socialist Coalition (TUSC), in which the Socialist Party plays a leading role, does. With modest votes at the last general election, TUSC made some small but important steps towards the founding of a genuine new, mass workers' party which can represent the 99%, rather than courting the millionaires. This came during a period of intense class struggle and a bloody world war, culminating in the Russian revolution of 1917. It was watered down from the demands of many on the left who looked to the Russian soviets - councils of workers and soldiers - for inspiration as to how society could be run in the interests of workers. But it was an important public declaration of support for public ownership of the economy. The same conference also voted for a minimum wage, a 48-hour week, the building of a million houses a year, a publicly owned integrated transport system, a wealth tax and an increase in public services. Labour Party leader Hugh Gaitskell concluded that Labour had lost the general election because of public opposition to nationalisation. He attempted to remove the reference to common ownership from Clause IV. This backfired. After a furious campaign by Labour's rank and file, the clause was not only left untouched, it was agreed to print it on all future Labour Party membership cards. After a series of lurches to the right, during which New Labour was born, Clause IV was finally rubbed out of Labour's constitution. The new clause, adopted in 1995, reads: "...We work for: a dynamic economy, serving the public interest, in which the enterprise of the market and the rigour of competition are joined with the forces of partnership and co-operation to produce the wealth the nation needs and the opportunity for all to work and prosper, with a thriving public sector and high quality services, where those undertakings essential to the common good are either owned by the public or accountable to them."